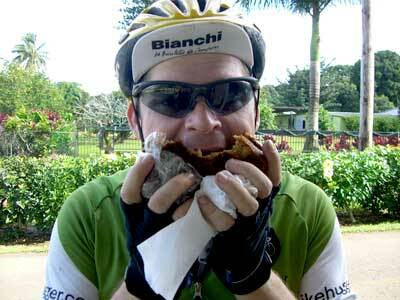 Before Maui rides, I’ll eat light, ride to a banana bread stand, and fuel up. Riding back from Hana, I went a little too far, and was bonking – I ate 1/2 a loaf in about two bites and that satisfied the hunger. Getting that hungry reminded me of various bonks and eating whatever was in sight – that includes a burger once and I don’t eat beef. What’s your worst bonk? How do you satisfy the hunger after a long ride?